Customize your parenting support so you get the exact elements you need to help your child and family grow. You can select any number of parent or child sessions you want. There are also complimentary tools that you can select from. For parents interested in customized and ongoing education and support. These sessions are typically conducted via Google+, Facetime or Skype. Our initial session will include a comprehensive family history interview, where I’ll learn more about your child (his or her development, temperament, etc. ), your parenting style, and the questions or challenges that brought us to this session. Every parent leaves the initial session with at least a few strategies to get started with. Emotionally responsive, consistent parenting – and how it will help you feel more prepared and empowered. Getting on the same page as your partner so that children receive clear messages and you can spend more time enjoying each other. Bringing home a new baby, new parent concerns, and support for new “older” brothers and sisters. Understanding and dealing with social/emotional development and behavioral issues (empathy, tantrums, defiance, anger, etc.) so you can best support your child as they go through these times and respond with successful strategies. Coping with the challenges of raising a young child with or without special needs so you can spend less time worrying, and more time being happy, learning, and growing with them. Support for developmental milestones (potty training, sleep training, separation, etc.) so you have a more powerful role as a parent in their growth. Work, life, and time management that will help you find a balance. Deal with sibling rivalry to encourage growth and bonding between siblings. Guided parent education for interacting with, and supporting the development of, young children with special needs. Case coordination, team building and referrals to providers and resources, so your child and family’s specific needs are met. Unlimited (but reasonable) weekday email access. When you work with me you’ll always have someone to turn to when things are particularly tough or when you have a question about strategies or development. For children in the New York City area who would benefit from ongoing, specifically-designed activities, strategies, and tools to support their development. Observation during which each child is individually assessed and a plan is created to help your child reach their fullest potential. Home or school-based play and behavior therapy to help improve their day-to-day functioning and give them the tools they need to be successful. Special education (special instruction) for young children who have developmental delays, both diagnosed and undiagnosed. Improved pragmatic language, social, and play skills so their efforts at school, with family, and with friends are more rewarding for them. Support for reaching developmental milestones (potty training, separation, moving to a bed, etc.) so they have everything they need to be successful. Facilitated play dates (with family members or peers) to offer children an opportunity to make friends, successfully sustain interactions, as well as practice and use the skills they are developing. Referrals to providers and resources so your child and family’s specific needs are met. You will receive a personalized copy of the action steps I have developed for managing challenging behavior and supporting your child at home. Typically requested after parent and/or child sessions. When you want to build your child’s skills and further support their development, a customized list of materials and/or activities is perfect to give you the guidance you need to help your child do so. It also includes website links, based on your child’s needs and interests, so you’re able to have quick, easy access to activities you can start implementing today. The bottom line at Dana’s Kids is meeting the needs of families and children to the best of our abilities. Dana’s Kids believes in a team approach and will both collaborate with current therapists, doctors and classroom teachers, as well as provide you with appropriate referrals to build the best possible team for you and your child. 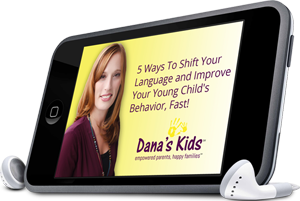 Dana’s Kids can provide ongoing case coordination to keep goals, strategies and therapists, current with your child’s needs and their greatest potential. Still have questions? Check out the F.A.Q.s for more answers!